Wonderfully illustrated, with peek-through windows, this carry-along board book is the perfect introduction to talking with God. It offers a carefully chosen mix of traditional and original prayers and Bible verses. 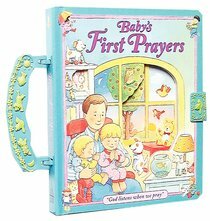 About "Baby's First Prayers (Handle)"
This is a collection of well-loved, traditional and original prayers and Bible verses.